To ask other readers questions about Loonshots, please sign up. Loonshots is a thought-provoking blend of history, physics, and business which seeks to explain group decision-making about "loonshots". I am a social scientist so the idea of thinking about group behavior through the lens of phase transitions (think ice to water or water to ice) was fascinating to me. The real-world examples ranging from WWII to cancer research were interesting and I found the author's personal stories most compelling of all. You would imagine that the first time someone presented the idea of using a beam to detect ships and airplanes, or a drug to reduce cholesterol, or a drug to kill tumors by choking their blood supply, there would be wild jubilation welcoming such a world-shaking breakthrough. Aaaand you would be wrong. The folks who came up with such well-duh-obviously useful innovations as radar, statins and anti-angiogenesis drugs were rejected, and again, and again, for between 12 and 32 years. Loonshots are “ You would imagine that the first time someone presented the idea of using a beam to detect ships and airplanes, or a drug to reduce cholesterol, or a drug to kill tumors by choking their blood supply, there would be wild jubilation welcoming such a world-shaking breakthrough. 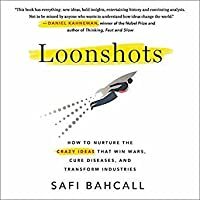 Loonshots are “widely dismissed ideas whose champions are often written off as crazy.” Through dozens of engaging stories told with insight and wry humor, Bahcall describes how loonshots (such as radar, the internet, and Pixar movies) come about, how to nurture them, how to champion them, and how to keep from inadvertently killing them. A gifted storyteller, Bahcall populates the narrative with characters endlessly fascinating through pluck, stubbornness, luck, or sheer genius: Vannevar Bush, the creator of the Office of Science Research and Development which basically won WW2; Akira Endo, the Japanese chemist who screened 6000 fungi to discover statins only to have his work stolen; Judah Folkman, the saintly discoverer of angiogenesis; Juan Terry Trippe, the larger-than-life founder of PanAm; Charles Lindbergh; Edwin Land, the supergenius founder of Polaroid; and Steve Jobs, who continues to get a lot more credit for Apple’s products than he deserved. In each of these instances, Bahcall goes deep, uncovering the complexities that belie simplistic origin stories and hero worship (Jobs and Newton are notably knocked down a few notches). Bahcall has done some serious sleuthing here. He also has a flair for super-clear explanations of complex scientific subjects. 1. Separate the phases: Separate your artists and soldiers. 2. Dynamic equilibrium: Love your artists and soldiers equally. 3. Critical mass: Have teams that can do the job. In the latter part of the book, Bahcall presents a plausible quantitative model for the various forces that incline team members towards loonshot vs franchise behavior, and how to tweak those variables to get the kind of company you want. I found this book enjoyable and enlightening enough to have read it twice already. If you are an entrepreneur, scientist, artist, drug developer, military officer, or just a rabid fan of ideas with some of your own you’d like to make real, you should find out about P-type (product) loonshots vs S-type (strategy) loonshots; the Bush-Vail rules; systems mindset vs outcome mindset for doing postmortems; and the dreaded Moses trap. Also, why *does* the world speak English and not Chinese, when the Chinese invented printing and gunpowder hundreds of years before the West? With the word “loonshot” likely poised to become part of the vernacular in innovative circles, this is the book that puts you ahead of the curve. Consider it the most fun required reading you’ll ever do. a dynamite book. brilliantly written. good ideas. safi bahcall is a great story teller, and these tales are well worth telling. Full disclosure—I did some of the research for Loonshots, so I know the book (and the author) quite well. That said, it's a fascinating mix of history, science, technology, and organizational management (and never did I think to use the words "fascinating" and "organizational management" in the same sentence), written in a conversational style that makes complex ideas accessible, without oversimplifying. This is probably one of the best books I’ve read of 2019 so far. It was full of so much practical insight and lessons about life, business and relationships. He covered people like Steve Jobs, Edwin Land (founder of Polaroid) and many other people from history. He talked about phased transitions - using traffic as an example. Smooth flow of cars to a crowded highway full of traffic. One small tap grows exponentially until it becomes a traffic jam. Small disruptions grow suddenly. A smooth flow v This is probably one of the best books I’ve read of 2019 so far. It was full of so much practical insight and lessons about life, business and relationships. He covered people like Steve Jobs, Edwin Land (founder of Polaroid) and many other people from history. He talked about phased transitions - using traffic as an example. Smooth flow of cars to a crowded highway full of traffic. One small tap grows exponentially until it becomes a traffic jam. Small disruptions grow suddenly. A smooth flow verse a jammed flow. Phantom jams. When density of cars reached a critical threshold, the traffic slowed from a smooth flow to a jammed state. 1. At the heart of every phased transition is a tug of war between two competing forces. 2. Phased transitions are triggered when small shifts in system properties cause the balance in those system forces to change. They are a mathematical certainty. He talked about Jane Austen and what he called the 2 forces tug. He said as people are paving their path and deciding what to do they often have a competition between entropy and bonding energy. He used a really good analogy for this. He described a giant egg carton with 144 sections 12 x 12 and it has marbles instead of eggs. He explained it being English’s inside a plexiglass type of housing and as you move it the marbles get close to the edge of falling out of their compartment. The more vigorous the shaking the marbles eventually all fall out which is an example of entropy. This can be called temperature the hotter the temperature, the tug of war between entropy - heat and bonding energy - cold. He talked about curing cancer and so many other interesting subjects. He discussed system vs outcome decision making and how many of the best ideas appear to have bad outcomes prior to them being successful and how it’s important to focus on the cultivation of a good system vs getting deceived by the outcomes alone. This is an excellent book that I will continue to ponder and likely read again. Loonshots is enjoyable and interesting and unlike many other business books I had not read or heard of many of the shared stores. The author has the gift of taking complex ideas and making them understandable. The challenge with the book was two-fold. Each story is too long - I kept thinking "I get it" lets move on to the application of the concept. And that is the second area where I thought this book fell short. The application ideas were too short. As a recreational book I'd give it 4 stars. Loonshots is enjoyable and interesting and unlike many other business books I had not read or heard of many of the shared stores. The author has the gift of taking complex ideas and making them understandable. The challenge with the book was two-fold. Each story is too long - I kept thinking "I get it" lets move on to the application of the concept. And that is the second area where I thought this book fell short. The application ideas were too short. As a recreational book I'd give it 4 stars. I didn't find it valuable as a business book. Many transformative ideas wallow for years because organizations and people don’t realize the need for two modes: operational/franchise mode (run the biz - think ‘soldiers’) and high-risk, transformative exploration (think ‘artists). Illustrated through numerous historical instances (not all business), the author shows how you need to nurture both and the transitions between the two to thrive. Definitely a thought provoking read - well constructed balance between illustration, abstractions, and Many transformative ideas wallow for years because organizations and people don’t realize the need for two modes: operational/franchise mode (run the biz - think ‘soldiers’) and high-risk, transformative exploration (think ‘artists). Illustrated through numerous historical instances (not all business), the author shows how you need to nurture both and the transitions between the two to thrive. Definitely a thought provoking read - well constructed balance between illustration, abstractions, and practical advice. A very simple thesis, nicely presented. Maintaining the creative tension across loonshots and franchises is key; phase separation and dynamic equilibrium (keeping both artists and soldiers functioning separately yet also knowing how and when to bring them together) represent the tension point for getting it right. Fav quote (p.37) "Luck is the residue of design". 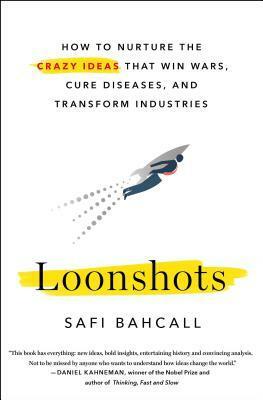 Bahcall also provides insight into what he terms Product and Strategy loonshots, with well-known, historical examples. An enjoyable re A very simple thesis, nicely presented. Maintaining the creative tension across loonshots and franchises is key; phase separation and dynamic equilibrium (keeping both artists and soldiers functioning separately yet also knowing how and when to bring them together) represent the tension point for getting it right. Fav quote (p.37) "Luck is the residue of design". As one who grew up professionally in the Bell Labs scientific culture, I have thoroughly enjoyed and without reservation highly recommend Loonshots. Although it's title and central thesis focuses on the dynamic structural patterns found in the physics of state phase transitions and power law mathematics responsible for powering humanity's really big bold projects and ideas, the historical tour Safi Bahcall takes us on is by itself breathtaking and IMHO worth your time. Entertaining anecdotes on innovation. I find the developed framework of loonshots and how to foster them interesting and inspiring. However, I found the theory is based on anecdotes and generalisations too much for my taste. It actually contradicts other (more research-focused) books like Drive: The Surprising Truth About What Motivates Us. Safi has delivered a gem, especially for those with a keen interest in pharma and the evolution of scientific advancement. Many unique perspectives though the lens of physics. Very interesting book about crazy new ideas and how they make it to their final form. Well written and worth reading for all the fun historical stories about things like Pan Am as much for the main point. Loonshots was a fair book, but not overly great. The author did a poor job defining his terms, particularly the P-type definition was weakly delivered. Ultimately, the book reads like a dissertation that received encouragement from colleagues. The message was decent, just not overly well delivered. This book was Stevo's Business Book of the Week for the week of 3/17, as selected by Stevo's Book Reviews on the Internet. You can find me at http://forums.delphiforums.com/stevo1 or search for me on Google for many more reviews and recommendations. I am a bit anti the term because the term moonshot drive's me bonkers. However this book has something interesting to offer, a lot of things, and it does so with substance and solid structure. One to come back to, but something for those with loony ideas, and those that manage them. This book contains some very interesting business innovation stories and they are a nice bonus to chapter 7, which is the core of the book. If you only have one hour, listen to chapter 7, it should be mandatory reading for any CTO. In order to change a business culture, change the structure somehow. It’s the oddball ideas that most often make the difference. Fun mix of business, physics, and history. There are a few incredible insights in this book that make it well worth the read.